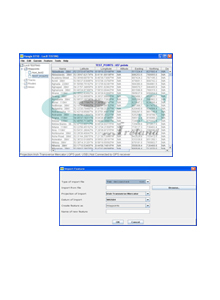 Hangle is a utility created by GPS Ireland to allow professional users of Garmin GPS 60 and GPS 72 get more from their�Handheld GPS Receivers.�Hangle will also import and export in multiple coordinate systems and formats and�therefore can�be very useful to GIS users too. Hangle will Import MIF, SHP, DXF, CSV, TXT and Garmin GPX data for upload to the GPS and will also export in these formats plus Google Earth, MapQuest and NMEA. Most Handheld GPS receivers do not support the capture of Lines (Polylines) or Areas (Polygons) in an accurate way. The most accurate way is to store waypoints on the receiver and convert them afterwards. Hangle allows easy conversion of Waypoints to Polylines and Polygons with a length and area calculation displayed once created. Use abbreviations in the field to indicate the start or end of features and to define feature names and attributes and Hangle will do the interpretation and conversion when data is downloaded. Just fill out the abbreviation table in Hangle to match what was used in the field. Hangle will import and export in multiple coordinate systems and can be used just to convert between one and the other even if no GPS is being used.�It handles the new Irish Grid System � ITM and has�UTM,�UKGrid, Irish Grid, Lat/Long, MGRS and Slovakian Grid.